Draft version, April 6, 2007. 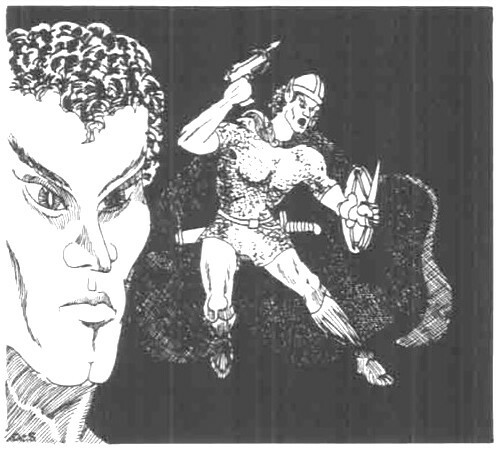 His suggestion was that the original was devoid of any real-world racial connotations, but that some later illustrations of the drow gave them a real ethnic skin tone (as opposed to jet black) or gave them racist cultural associations, like Xen'Drik in Eberron. I know relatively little about the full history of drow illustrations and adventures, so I won't comment about the process of development. 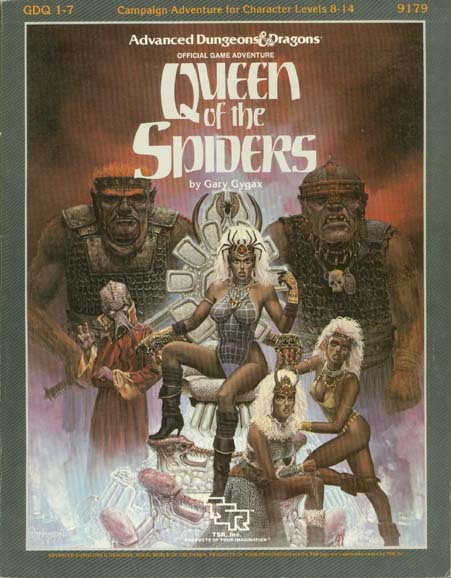 I note in passing Module G3 did have the drow lead by high priestesses who were "strangely attractive" (with Charismas 18 and 17) -- but the illustrations were only of male drow, while the later GDQ1-7 collection cover obviously emphasized the female drow. I suspect this mostly had to do with marketing differences. While covering the drow, I should mention that it has become fairly common for white gaming fans to dress up in black makeup as drow characters. cf. GenCon 2006 pictures, for example. Such costuming has been going on for many years, but recent commentary on it has fanned further the controversy, in particular as it mixes with other examples of black-skin makeup. For example, Eric Grandy posted Blackblackface? about the band "blackblack" who dressed up as "shadows". I think I should include some general statements here about race relations in general. Part of the controversy that seems to surround the race discussions seems to be different reactions. So, for example, I said that having a fictional people where the black-skinned ones are evil and the light-skinned ones are good has "racial connotations" -- this in turn was interpreted as a charge of blatant racism and a call for "blanket censorship" -- which in turn I misinterpreted. The problem is that while everyone agrees that the term "racism" is a bad thing, there is strong disagreement on the specifics of that. For example, suggested that an important test regarding racism is whether the thing in question does identifiable harm as a concept. The problem is the question of what identifies harm. Notably, he suggests that the drow are not problematic, but orcs are. He notes, "Stereotypical orcs closely resemble racist stereotypes about Africans: violence, strength, stupidity, fecundity, faux-tribal organization and even the need to be led. So it's the link to a real stereotype that's the thing." However, I'm not sure that matching stereotypes are the sole key to the issue here. A hypothetical series which has blacks always as non-stereotypical villains seems equally problematic. I brought up the case of the video "A Girl Like Me" on YouTube, where black-skinned children picked a doll based only on the skin color, often identifying the white doll as a good one. I think that this demonstrates that harm was done. There have been many such studies in recent times with similar findings, not just in the U.S., but also in the Carribean and in Ghana. However, what caused the kids to more often pick the white doll as the good one? I doubt that any of the kids had any explicit programming where, say, they read stories which explicitly teach the message that all black-skinned characters are bad. However, I think there are a myriad of other possible influences -- including examples from the media as well as personal experiences. Lacking a known cause, I think that possible influences should be seriously considered. Regarding media examples, there is the issue of ubiquity. There is nothing wrong with having an individual villainous character of a given racial type -- be that African, Indian, Native American, Indigenous Australian, or whatever. However, if hypothetically in aggregate almost all the dark-skinned characters are evil and the light-skinned ones are good, then there are definite racial overtones. It could in principle be an insightful parody, a commentary, or other transformative work. But race would definitely be an issue. So, the question is, is there an issue regarding fantasy races in general and the drow in particular? My general reaction to this was that writing in modern America, if you write a story in which you invent a people where the light-skinned ones are good and the black-skinned ones are evil, there are definite racial connotations. That doesn't mean I don't think that it should be done. I think that there are many interesting stories and scenarios that can be made using that as a premise about race. draws a more subtle distinction that the original drow (as seen in the first set of pictures) had no real-world racial associations, but that some later reworkings were problematic. As I mentioned earlier, he notes in particular later illustrations of the drow which had a real ethnic skin tone (as opposed to jet black) or gave them racist associations. I'm inclined to see it as a change of degree rather than a sudden change in kind. Obviously, I do not feel that the drow inherently convey a message that real-world Africans are evil. However, it does add to a trend of dark skin being a signifier of evil. While they aren't always stereotypes of jungle savages, they were from the start the exotic Other lurking in the shadows behind the brutish giants, wielding unique weapons and lead by "strangely attractive" dark-skinned priestesses. So what am I saying should be done? First of all, I am flatly opposed to any sort of censorship. I favor free expression -- which includes both artistic expression but also critical analysis of art. I think that we should continue to have games which produce creations like the drow, but we should also be able to talk about the racial connotations without people crying out about censorship. There is a class of author who is willing to talk about the racial connotations of her work -- who will listen to criticism and not follow it blindly, but reflect on what it says about the content. I like authors to be like this. If, say, I were running the D&D line at this point, I would not try to excise the drow from the product line -- but I would try to consciously introduce more dark-skinned, non-exoticized good characters and creatures. I was impressed by what I read about Jeff Grubb's "Guild Wars: Nightfall", for example. However, there are also some authors who want to be "safe" from charges of racism. As soon as they hear there is discussion of the racial connotations of their work, they feel that they have failed, and try to deny any real-world connotations. If you genuinely feel this way, and don't want to engage or think about racial connotations -- then I would indeed recommend that you don't create a race where the distinguishing characteristic of the evil kind are their black skin.